Asparagus officianalis is the young shoot of the plant related to the lily family and comes in a variety of colours from white, light green, dark green and violet or purple. The Persian word Asparag means ‘a sprout’ and asparagus sprouts forth from the ground as if out of nowhere. In about the 1st century AD Romans grew asparagus in their gardens, then after the fall of the Roman Empire Arabs continued its cultivation in Syria, Egypt and Spain. It then spread to many other parts of Europe including France and England where it was affectionately known as ‘sparrow grass’ then later changed to ‘sparagus’ then ‘asparagus’. In the 19th century it spread to China and other parts of Asia. Not being too shy about it asparagus has a medicinal reputation and can also produce a harmless sulphur-like odour in the urine of those who eat it, which might highlight the fact that the name officianalis means ‘of the dispensary’. Asparagus is not inexpensive and its price can be justified by the extraordinary way in which it is grown. After the seeds are sown the plant is unproductive for the first two years. In the third year young spears can appear in late winter through to early summer and may be just thick enough to harvest. Asparagus plants can be productive for many years but essentially in a commercial situation the land is unproductive for half the year and hand harvesting and maintenance is very labour intensive. 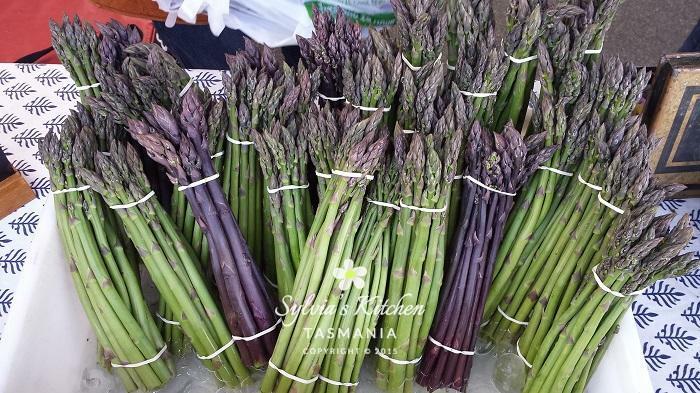 Thanks to farmers like Lucy and Philip Headlam who have been growing asparagus since 1989 at Headlam Farm Tasmanian Fresh Asparagus Pipers Brook, Tasmania, we can relish this fresh bounty in Spring. This entry was posted in Cooking & Kitchen Tips, Did you know?, Local Produce, Spring and tagged Anzac Biscuits, Local Produce.